One of the highlights of a wedding has always been the cake. Traditionally a wedding cake is for both the bride and the groom, decorated in the theme that the both of them choose. 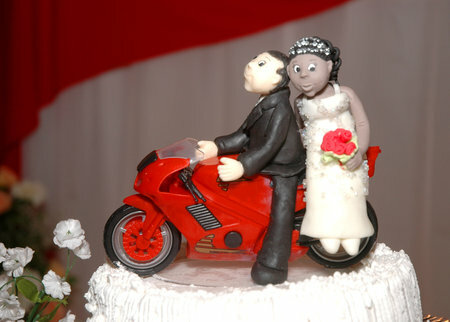 What has becoming a new trend though is the groom’s cake. This is a cake made specifically for the groom by the bride as a show of love and a funny interlude. The groom’s cake should be an expression of the groom’s personality and his favorite hobbies. This can be done by taking something such as video games and turning it into the theme for the cake. You can either make the cake yourself or have it made by your local bakery. The important thing is that it’s something that the groom will love and appreciate. The groom’s cake is presented after the traditional wedding cake. This is supposed to be something fun and can even be an inside joke between you and the groom. The point is to show your groom how much you love him and understand his likes. Here are a few ideas for your groom’s cake! Video Games: Every guy loves video games. This is pretty much a fact, so why not create a cake based on your groom’s favorite game? This would be a great time to involve your groom’s best man or other friends so you can get a good idea of what he would want to see on the cake. A popular idea is turning the cake into a Super Mario themed cake; it’s a colorful and fun creation to make! Sports: If your groom is a sports man than this is the perfect cake idea! Much like a birthday party cake, turn your cake into your groom’s favorite mascot or something along those lines. You can simply do it in the team’s colors and put their logo on it as well. You could also simply make it a football, baseball, soccer ball, or any other sport paraphernalia you can think of! Music: For those who are obsessed with a certain band, making the cake musically themed is certainly an option. For example you could put the lyrics to his favorite song all around the game with their logo as a topper. You can even make it into a musical instrument if your soon to be hubby plays one such as a drum or a guitar. The options are endless for a musically themed cake! Hobbies: For a groom who basically has a favorite thing to do, you can simply make this the basis for the cake. For example if he loves cars you can make the cake resemble on or their favorite car brand. If he loves to fish you can make a nautically themed cake. You can be very creative with this idea and make it something your groom will find both amusing and amazing! Subject: LongIsland.com - Your Name sent you Article details of "Making the Perfect Groom's Cake!"